Legendary Brooklyn, New York metal band Life of Agony have announced a run of shows on the west coast in May. The shows will be the band’s first headlining gigs on that side of the country in a decade. Since 1989, with years off in between, the band have been destroying fans with their unique brand of alternative metal. The band was formed in 1989 by singer Mina Caputo, bassist Alan Robert and guitarist Joey Z. Previous members have included Type O Negative drummer Sal Abruscato, ex Pro-Pain and ex Crumbsuckers drummer Dan Richardson and ex Ugly Kid Joe singer Whitfield Crane. In 2014 the band announced they were reuniting for the third time and they have remained active since. On January 12, 2016, Life of Agony announced that they were signed to Napalm Records and released A Place Where There’s No More Pain, their first studio album in 12 years, on April 28, 2017 with a tour to follow. Previous albums have included 1993s River Runs Red, 1995s Ugly, 1997s Soul Searching Sun and 2005s Broken Valley. Additionally they have released two compilation albums and three live albums. 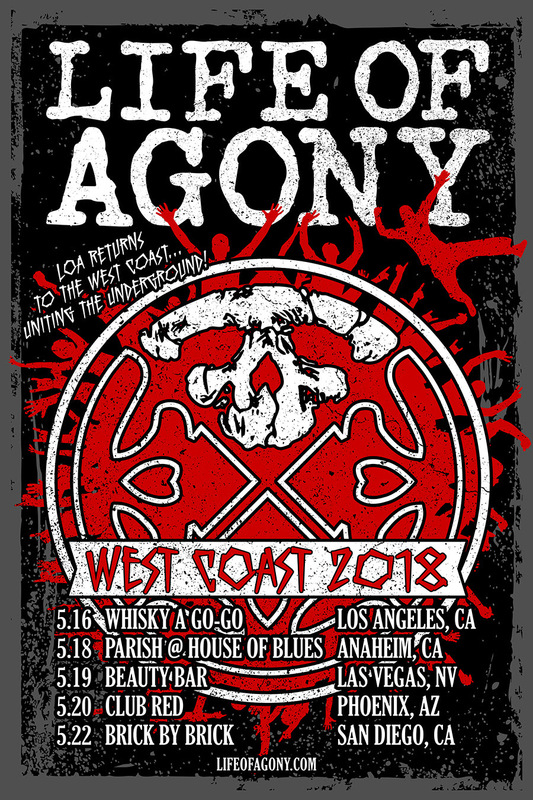 Life of Agony west coast tour dates.